Salmon, Pan-Fried, with Capers and White Wine Dill Sauce. Lemon and capers combine to add lots of flavor to this simple preparation. Quickly seared, they can finish cooking over low heat while you enjoy the salad. Slice lemon, 4 - 6 slices. Heat butter and oil in large non-stick skillet over medium-high heat. Add salmon, skin-side up, and sauté 5 minutes, until it starts to brown. Turn skin side down. 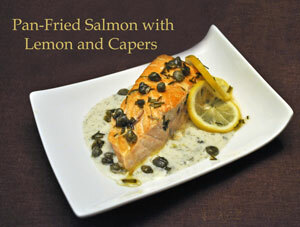 Lay the sliced lemon on top of the salmon and sprinkle with capers. Turn the heat to low, cover and let finish cooking, 5 - 10 minutes, depending on thickness. Remove and slide the filets of the skin. Serve, garnished with lemon slices and capers, dill sauce on the side. In small saucepan over medium heat bring wine and stock to a boil. Mix cornstarch in water and stir into simmering stock. Cook until thickened - should be quite thick. Remove from heat and stir in crème fraiche. Cover and keep warm until serving.